BREAKING: Martian avalanche caught in the act! 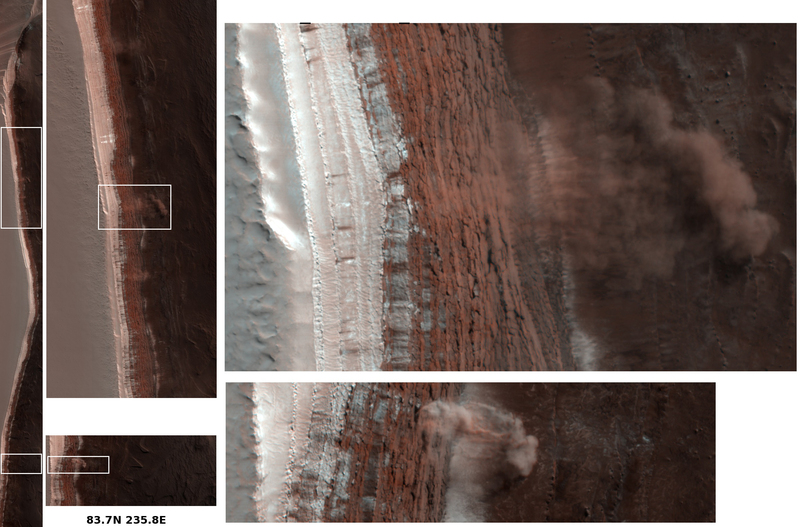 This is TOTALLY HAWESOME: an avalanche on Mars was caught in the act by the HiRISE camera. This picture shows the billowing dust cloud from an avalanche of ice and dust along scarps — sheer cliffs — near the north pole of Mars. To give you a sense of scale, the cloud is about 180 meters across, and about the same distance from the base of the cliff. You can see the cliff in the middle of the picture. It’s 700 meters high (2300 feet!) and slopes at about 60 degrees; that’s pretty close to vertical. To the left you can see white carbon-dioxide frost (which is evaporating as spring ensues in the Martian northern hemisphere) at the top of the cliff. If my (very) rough calculations are accurate, it would take a rock about 20 seconds to fall from the top of the cliff, and would hit the bottom at about 70 meters/second, or about 150 miles per hour. Look out below! You can read lots more about this on the HiRISE page. Sidenote: after the disappointing news from HiRISE this weekend, I feel a lot better about this. Totally amazing. I might even say ground breaking. Update: The HiRISE blog has a more personal take on this as well.